Regina Caeli (Queen of Heaven): Queen of Heaven, rejoice, alleluia. For He Whom you did merit to bear, alleluia. Has risen as He said, alleluia. Pray for us to God, alleluia. Rejoice and be glad, O Virgin Mary, alleluia. For the Lord has truly risen, alleluia. Let us pray. O God, Who by the resurrection of Your Son, our Lord Jesus Christ, gave joy to the whole world: grant, we pray, that through His Mother, the Virgin Mary, we may obtain the joy of everlasting life. Through Christ our Lord. Amen. 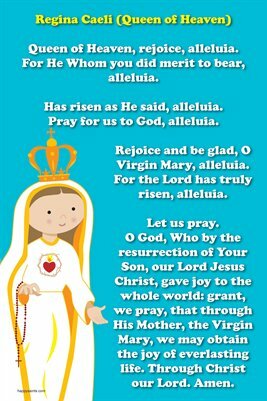 The Regina Caeli Queen of Heaven Prayer 12 inch x 18 inch poster features a favorite traditional Catholic prayer with Happy Saints artwork that the family will enjoy. Great for home, church and school. Visit www.happysaints.com for more resources.